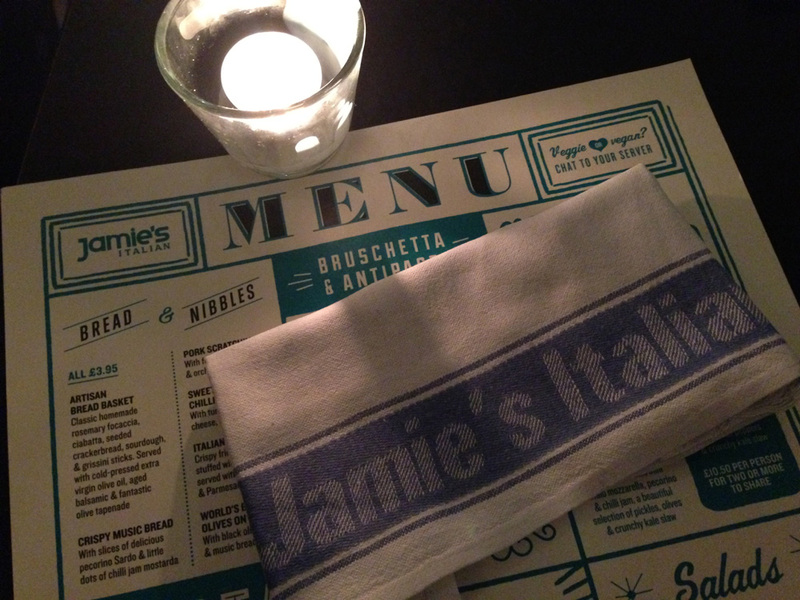 This week I enjoyed a midweek treat, as Jamie’s Italian invited me along to check out their Manchester restaurant. 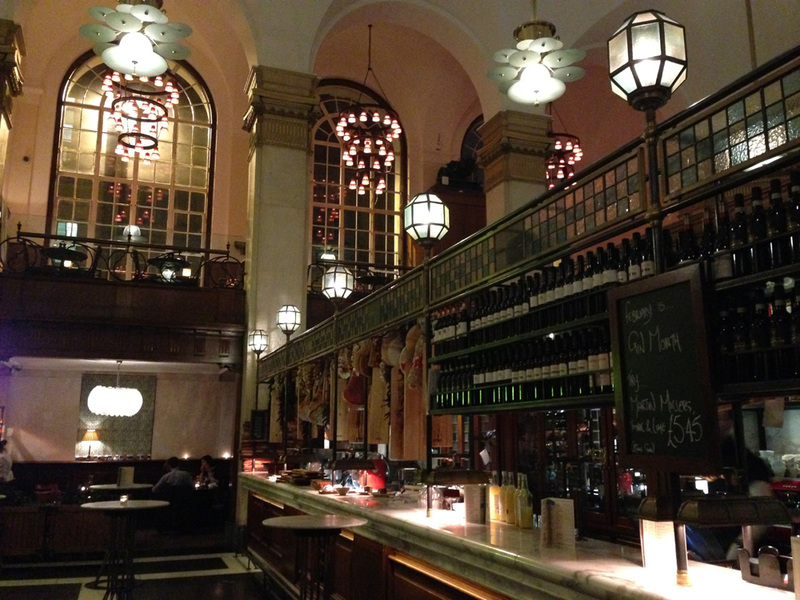 Jamie Oliver’s restaurant chain now has 30 individual restaurants, and the Manchester one has the benefits of a great location on King Street and being housed in a gorgeous renovated 1930’s bank building (complete with vault, which has been converted into a exclusive private dining room). It’s a grand space full of stunning features, and even the exterior is pretty impressive-looking so as a restaurant it feels very luxurious. On entering we were greeted by a friendly hostess and the huge wine bar and ham bar (if that is what it’s called – a bar decorated with hanging cured meats). Onto the important matter of the food… We decided not to sample starters, having our eyes keenly fixed on the dessert menu (more about that later), and went straight onto the main courses. 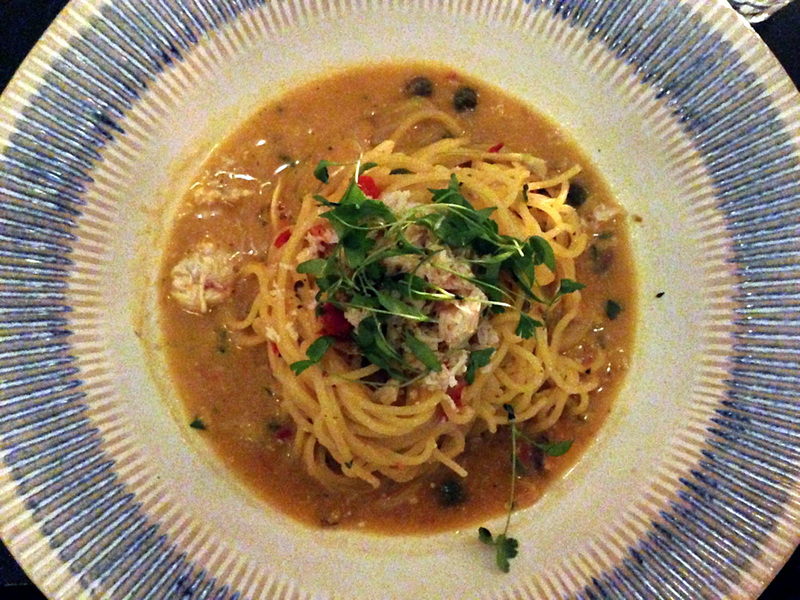 There were plenty of main course and pasta options, including quite a few tasty sounding specials, but I eventually decided on the Fresh Crab Spaghettini. It was a very tasty dish actually, full of flavour from the white crab meat, fennel, capers, anchovies and a real kick from the chilli. It’s completely different from anything I would cook for myself or might normally go for, but as I associate Jamie Oliver with seafood I really wanted to sample something like that, and I wasn’t disappointed. 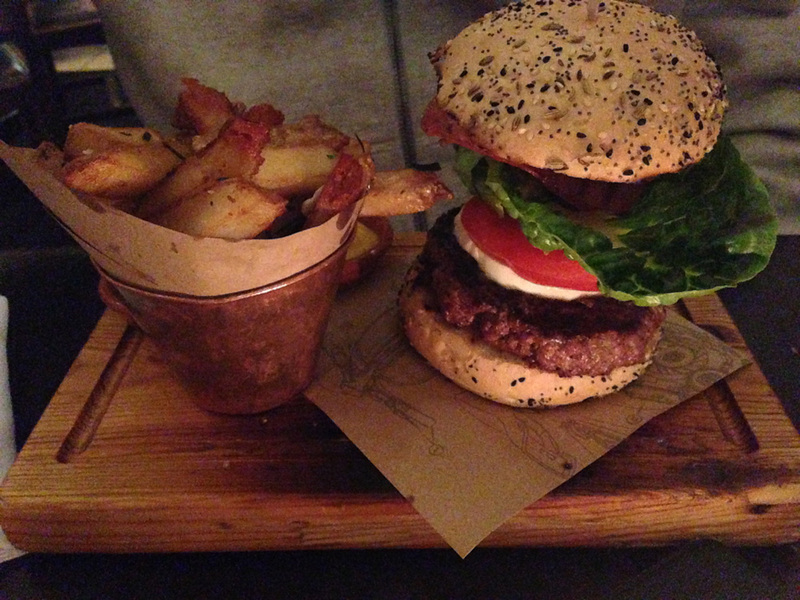 Craig went for a more mainstream option in the Jamie’s Italian Burger with Funky Chips. 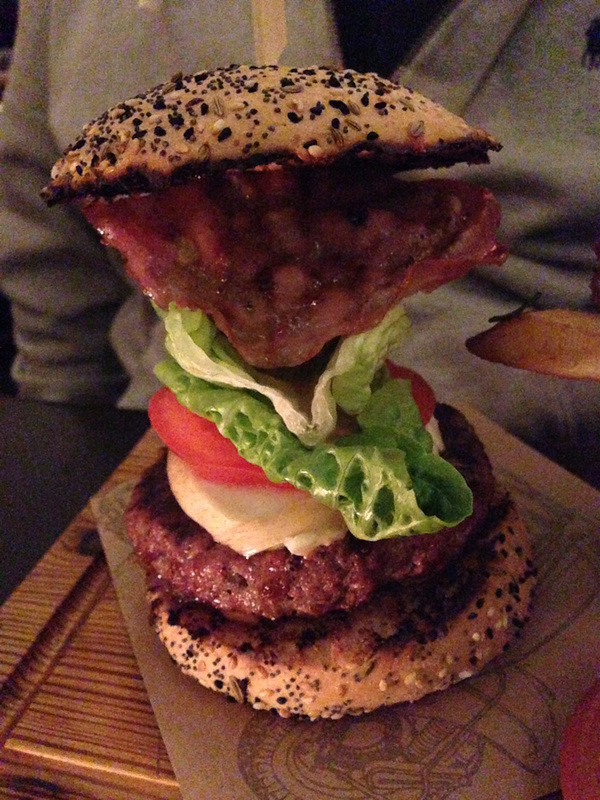 The burger itself was pretty epic – check out that side view below – and he had a lot of praise for it, saying that the beef was delicious and tender and he apparently enjoyed the physical challenge of eating it!. I tried some of his funky chips myself and would recommend these to anyone – what could be better than triple-fried chips cooked in fresh garlic and rosemary?! So, on to the desserts, and all I can say is that a dessert menu that has so many amazing-sounding options was always going to be problem for us. How do you decide between an “epic brownie”, lemon meringue cheesecake, chocolate and hazelnut arctic roll or sour cherry and almond tart with honey cream (and that’s not even all the options!)? 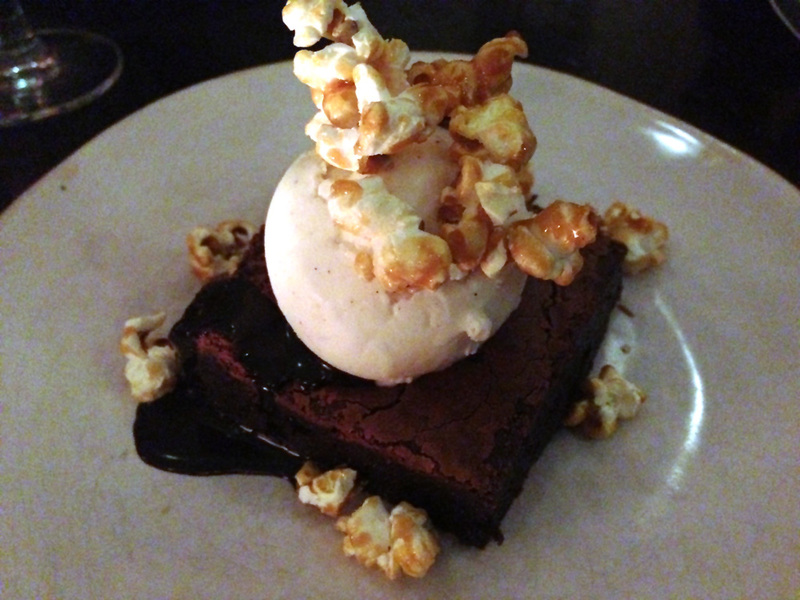 Well it took us a while anyway, and in the end I went for the epic brownie, which as you can see was intensely chocolately, gooey and fudgy, and was served with a scoop of vanilla ice cream and topped with toffee popcorn. Craig decided to go for the (slightly) lighter option of the arctic roll, which was quite different from the classic 70’s dessert. 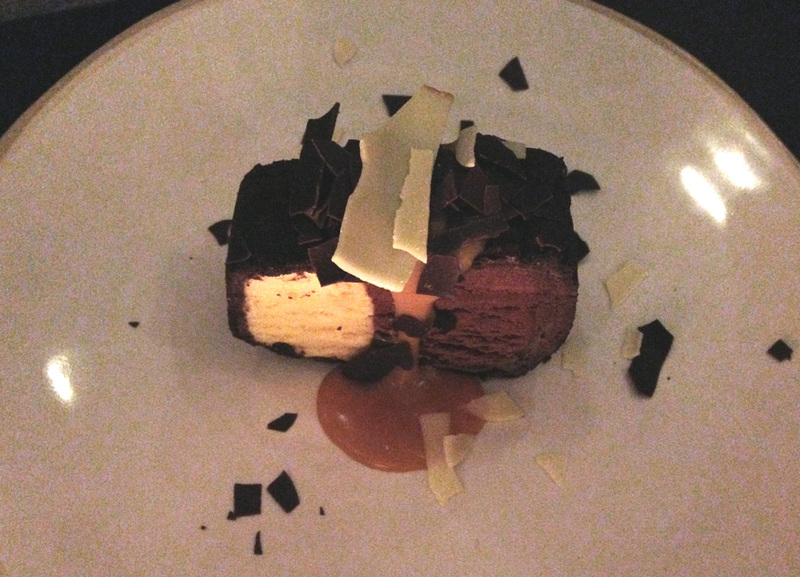 It was a chocolate and espresso frozen dessert cake coated in chocolate and served with butterscotch sauce, and he really enjoyed it! Everything about our visit was really great. Initially I thought it wouldn’t hurt if there was a little more space between the tables, but actually in the end we didn’t notice ourselves feeling too close to the other tables even though it was a pretty busy evening. Our waitress was great and had loads of recommendations as well as being very friendly, and overall we had a great evening! Love that you ditched the starters for a pudding, clearly a lass after my own heart. The desserts sound insane, especially the arctic roll! However, I’ve heard very mixed things about the mains at Jamie’s and my friend had a bad experience on her birthday :|! That was a while ago though!